Taking a look back at another week of news and headlines from Cupertino, this week’s Apple Loop includes Apple’s quarterly figures, falling iPhone sales, rising Apple services, FaceTime security problems, a triple-lens iPhone leaks, Apple leak confirms AirPods 2, and the screw that cripples US manufacturing. China’s general economic slowdown and trade tensions with the US were also credited. Additionally, Cook said that iPhone owners just aren’t upgrading as much as expected. He pointed to Apple’s cheap battery-replacement program as one reason iPhone upgrades were down, but he also noted that smartphone subsidies which made it easier for consumers to take the leap have been reduced or eliminated in some countries like the United States and Japan. How It Ends… Will The iPhone Follow Palm, Nokia, And Psion? Following a number of years of relatively flat sales, the iPhone sales curve has started the downwards trend that will be hard to break. It’s a curve familiar to historians of Nokia, Motorola, Palm, and other historical smartphone innovators that became the incumbent. The question now is if Apple’s risky decision to look at revenue from its software and services to cover the expected shortfall from the loss of iPhone revenue over the next two to three years will succeed. Read more here on Forbes. Can Services Rise In Time To Save Apple? That bad news was balanced out – perhaps even cancelled out – by the good news on services. A big increase compared to this time last year – 19% – and a very healthy gross margin of 62.8%. Apple is transitioning, slowly, into a different kind of company that isn’t so reliant on hardware, and these numbers show that so far that transition is going well. Just remember that the services side only delivered $10 billion of the $84 billion revenue… there’s a lot of ground to make up before it can equal the dominance of the iPhone in its budget. A bug in Apple’s FaceTime video calling feature has allowed anyone to call a phone or Mac and listen in before the other person picks up. The flaw works by adding yourself to a FaceTime call before the recipient picks up, tricking FaceTime into thinking it’s an active call and forcing the person you’re actually calling to start transmitting audio. Apple has now disabled the Group FaceTime feature on the server side, and reports suggest this has fixed the security flaw for most people. Some are still able to reproduce the flaw, but it’s likely that Apple is still in the process of replicating this across multiple servers. Apple is also planning to fix this on the client side with a software update later this week. Writing for Bloomberg, Mark Gurman and Debby Wu report on the latest leak around 2019’s new iPhones. It looks like Tim Cook will finally be equipping one iPhone with a triple-lens camera. But with the release not expected until September 2019, that’s going to be eighteen months after the competition. Is it all too late? Once more Cook’s Apple will be looking to technology that has become commonplace on competitors handsets, and charge a significant premium to the iOS-powered faithful. The inclusion of AR overlays and the use of the third camera and associated sensors will no doubt make for a solid demo come the launch in September, but Apple will be playing catch-up in the software stakes as well as the hardware stakes. The latest leak comes from Apple itself, so is hard to dismiss. 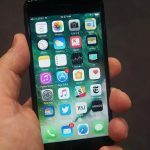 In the latest beta version of Apple’s iOS operating software, iOS 12.2, which has been released to developers but not the public yet, there is a set-up screen. This was reported by the ever-resourceful Guilherme Rambo at 9to5Mac. The challenges in Texas illustrate problems that Apple would face if it tried to move a significant amount of manufacturing out of China. Apple has found that no country — and certainly not the United States — can match China’s combination of scale, skills, infrastructure and cost. More in the New York Times.